RUSSIAN PRESIDENT VLADIMIR Putin has backed an official check into reported brutal attacks on gay men in Chechnya in his first public comment after German Chancellor Angela Merkel confronted him on the issue. Putin said he would personally “talk to the prosecutor-general and the interior minister” to ask them to help Kremlin rights ombudswoman Tatyana Moskalkova check the reports which have caused an international scandal. “I hope the colleagues respond and support you,” Putin told Moskalkova, whose role is to investigate rights abuses but is widely seen as a loyalist establishment figure. While speaking to the Kremlin ombudswoman in televised comments, Putin referred to the reports as “rumours, you could say, about what is happening in our North Caucasus with people of non-traditional orientation,” using a euphemism meaning gay. In March, the Novaya Gazeta opposition daily reported that Chechen authorities were imprisoning and torturing gay men in the conservative region where homosexuality is taboo. It said the authorities had detained more than 100 gay men and urged their families to kill them to “wash clean their honour.” At least two had been killed by relatives and a third died after being tortured, it reported. A group of Chechen men in a safe house near Moscow later confirmed to AFP that they had fled the region in fear of their lives after being beaten and imprisoned. Chechnya’s strongman leader Ramzan Kadyrov has fiercely denied claims of a crackdown in the socially conservative region. The muscle-bound former insurgent turned Kremlin-loyalist responded to Putin’s comments on Friday by telling journalists his authorities were “ready to closely cooperate” with Moskalkova, RIA Novosti news agency reported. But he claimed that majority-Muslim Chechnya does not have any gay people and suggested some gay people may be pretending to be Chechen to get asylum in the West. “Chechen society does not have the phenomenon called non-traditional sexual orientation: its people have lived for thousands of years according to different rules laid down by Allah,” Kadyrov said. Kremlin spokesman Dmitry Peskov initially downplayed the reports, saying there had been “no confirmation” of violence and arrests. After a delay, Russian investigators have said they are probing the allegations. Moskalkova said last month there had been no official complaints from victims. But today she said that there needed to be a mechanism for victims to report abuse when they are outside Chechnya and asked Putin to help create a working group to receive such complaints. She stressed that victims’ anonymity will be protected. This week, the foreign ministers of Britain, France, Germany, the Netherlands and Sweden wrote to their Russian counterpart Sergei Lavrov to press for an immediate end to any persecution of gay men in Chechnya. 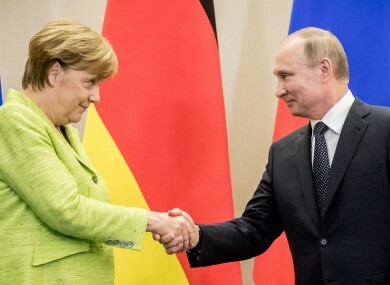 Email “Putin backs probe into violence against gay men in Chechnya after Merkel pressure”. Feedback on “Putin backs probe into violence against gay men in Chechnya after Merkel pressure”.